From their modest beginnings as roadies for avant-garde Swiss metal legends Celtic Frost, the members of Coroner carved out one of the most unique careers in the European thrash metal scene. They were originally pegged as a conventional thrash band, but their jaw-dropping musicianship and increasingly complex, almost prog rock compositions soon won over most critics, some of whom labeled them the Rush of thrash metal. Over the course of eight years and six albums, they fought constantly to expand the limiting boundaries of thrash, yet achieved only limited commercial success for their efforts. Still, their fearless experiments have allowed their albums to endure and stand the test of time better than many of their more celebrated peers. Guitarist Tommy T. Baron (real name Thomas Vetterli) and drummer Marquis Marky (aka Marky Edelmann) put in various tours of duty as roadies for the seminal Celtic Frost before founding Coroner with bassist/vocalist Ron Royce in 1985. In fact, Frost main man Tom Warrior sang on their Death Cult demo. Subsequently signing to the German Noise label, the trio debuted with 1987's R.I.P., then quickly followed it with 1988's Punishment for Decadence, which featured a surprising cover of Hendrix's "Purple Haze." With 1989's transitional No More Color, Coroner truly inaugurated their golden era and raised their standards on every front: from the stylized album artwork to the slower, tighter rhythms and riffs that revealed their incredible technical proficiency to the experiments that began breaking away from the limitations of thrash metal, both musically and lyrically. This ambitious vision came to full fruition with 1991's amazing Mental Vortex, which included a daring reconstructed cover version of the Beatles' "I Want You (She's So Heavy)." Recorded by top thrash producer Tom Morris, many expected the album to push Coroner's career to the next level and introduce them to a wider audience. But whether due to changing musical climates (alternative rock had just arrived) or simply being too ahead of their time, things just didn't play out that way. Disappointed though they were, Coroner regrouped and came up with an even more daring, unconventional album in 1993's Grin, which abandoned much of the thrash-based aggression of their early days and focused on challenging dynamics and eerie atmospherics. This move proved too radical even for longtime fans, ironically, and they remain split over the album's merits, some seeing it as a total sellout, while others consider it the band's greatest triumph. Coroner were apparently unsure themselves and succumbed to mounting inner tensions a short while later to go their separate ways. Noise Records wasn't quite ready to let the band die, however, forcing guitarist Baron to compile 1995's Coroner (a collection of outtakes, new tracks, and classic cuts) nearly a year after the group's demise, which required the help of drummer Peter Haas stepping in for the uncooperative Edelmann. After this release, Vetterli temporarily fronted his own band, Clockwork, before joining German thrashers Kreator for one album. 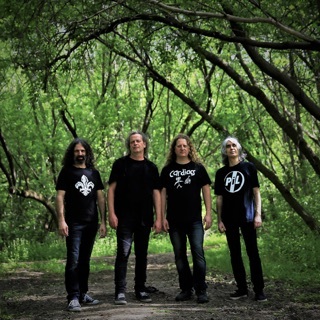 Edelmann assumed drum duties with his former mentor Tom Warrior's new band, Apollyon Sun.